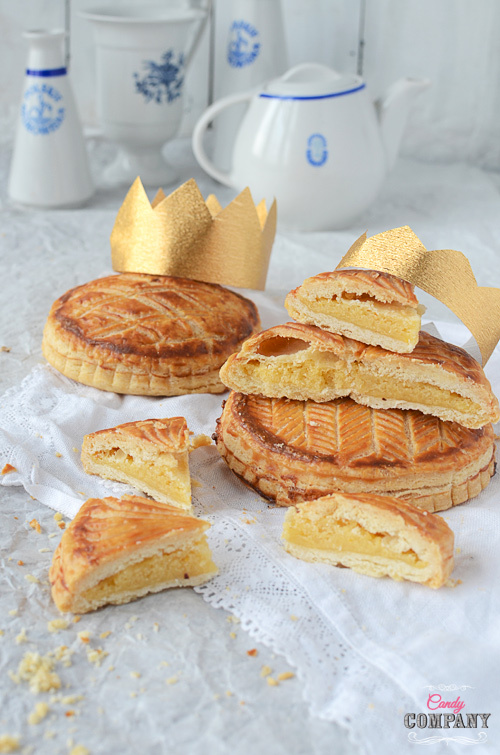 Galette de rois to ciasto jedzone we Francji w okresie świątecznym i w styczniu. Tradycyjnie piecze się je na święto Trzech Króli, w nadzieniu ukryta jest figurka, migdał lub ziarno bobu – ten kto je znajdzie w swoim kawałku zostaje królem i cały dzień nosi specjalną koronę. Galette de rois przygotowuje się z ciasta francuskiego i nadzienia migdałowego (czasem innego). Jest pyszne, delikatne, chrupiące i rozpływa się w ustach. Możecie użyć gotowego ciasta lub pokusić się o przygotowanie własnego, wierzcie mi czuć różnicę 🙂 Ja poszłam trochę na skróty i przygotowałam szybkie ciasto francuskie według Michela Roux (rough puff pastry), wymaga znacznie mniej wysiłku i czasu niż tradycyjne ciasto francuskie, a efekt jest podobny. Składniki na dużą tartę 23 cm lub 4 mniejsze. Ciasto wałkujemy tak by można było z niego wyciąć 2 kręgi o średnicy 23-24 cm, lub 8 mniejszych ok. 12 cm. 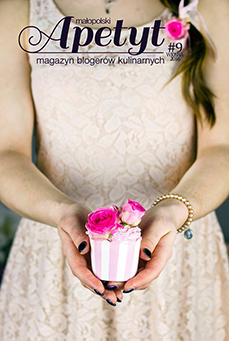 Wycięte blaty ciasta smarujemy nadzieniem zostawiając 2 cm marginesu. Margines smarujemy rozbełtanym jajkiem i nakładamy drugi blat, dociskamy krawędzie żeby ciasto dobrze się skleiło. Nożem zdobimy krawędź jednocześnie dociskając ciasto. Nakłuwamy tartę na środku, smarujemy całość jajkiem i nożem nacinamy wierzch robiąc ozdobny wzorek. Galette wkładamy do lodówki na 1 h (można na dłużej), w międzyczasie nagrzewamy piekarnik do 200 C. Przed pieczeniem ciasto ponownie smarujemy jajkiem. Pieczemy przez ok. 35 minut, aż zrobi się złoto brązowe. Jeśli planujecie sami przygotować ciasto obejrzyjcie ten filmik. Masło siekamy na masło kawałeczki i mieszamy z mąką i solą, rozdrabniamy masło palcami, aż powstaną okruchy obtoczone w mące. Wlewamy wodę w 2-3 turach, po każdym dodaniu lekko mieszając i zagniatamy, aż utworzy kulę. Staramy się robić to szybko, ciasto nie ma być jednolite – powinny się dalej w nim znajdować kawałki masła. Wałkujemy ciasto w prostokąt i składamy, powtarzamy proces dwukrotnie (zobaczcie na filmiku). Odkładamy ciasto do lodówki na ok 30 minut i ponownie 2 razy wałkujemy i składamy. Po tym czasie ciasto jest gotowe do użycia. Nadzienie przygotowujemy minimum 1 h przed pieczeniem. Masło powinno być naprawdę miękkie, ale nie roztopione. W misce ucieramy trzepaczką lub szpatułką (nie trzeba miksować) masło i cukier puder, a kiedy oba składniki dobrze się połączą dodajemy resztę i mieszamy do uzyskania gładkiej pasty. Krem wkładamy do lodówki na ok. 1 godzinę. Nadzienie na początku może być trochę płynne, ale zgęstnieje w lodówce. 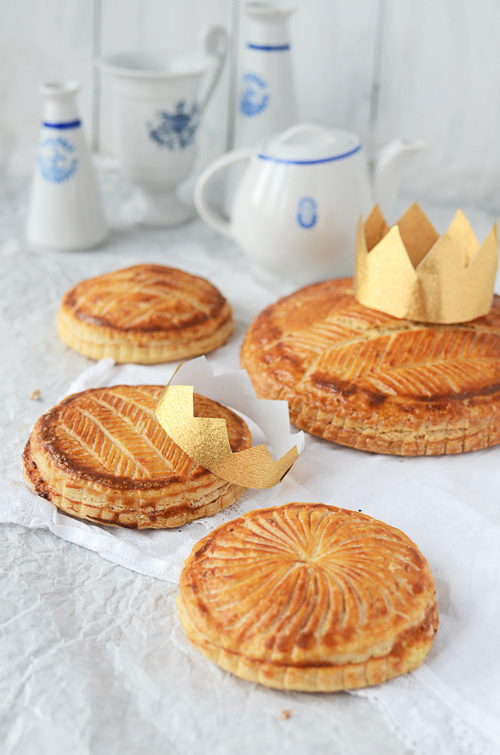 Galette de rois sometimes called King’s Cake is a traditional cake baked in France for the Epiphany festival (6th January) and during Christmas period. There’s a token hidden inside of the cake and whoever finds it in his/hers piece is called a king for the rest of then the day and wears a special crown – I’ve heard of this tradition before and I think it’s great! 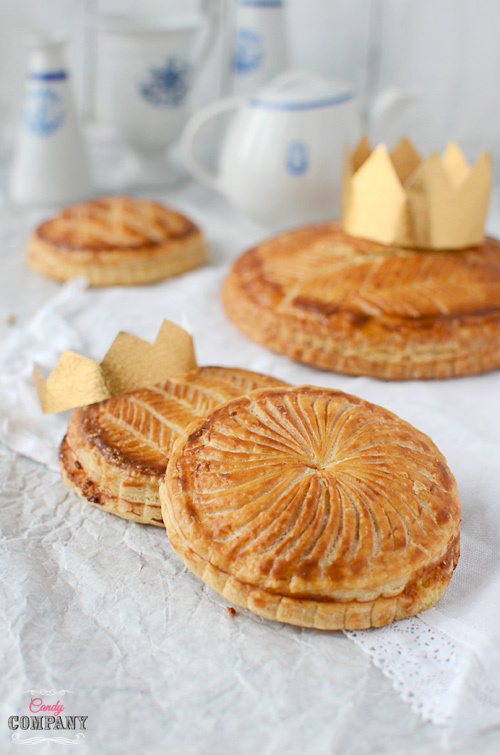 Galette de rois is made from puff pastry and almond filling, it literally melts in your mouth! The cake is not too sweet and has a very delicate flavor. Of course it’s best to use homemade puff pastry but since it’s quite time consuming I used Michel Roux rough puff pastry recipe and it turned out just delicious. Much better than store bought, believe me – it’s worth the effort. Rough puff is much easier and faster to make the traditional puff pastry. Roll the dough a bit and cut 2 discs, 9 inch diameter each (or 8 smaller 4 inch each). Place the almond filling in the center and spread on the dough living 1 inch margin. Cover with the second disc and press the edges to seal. Using a sharp knife mark the edge, pressing with your fingers to create a decorative edge. 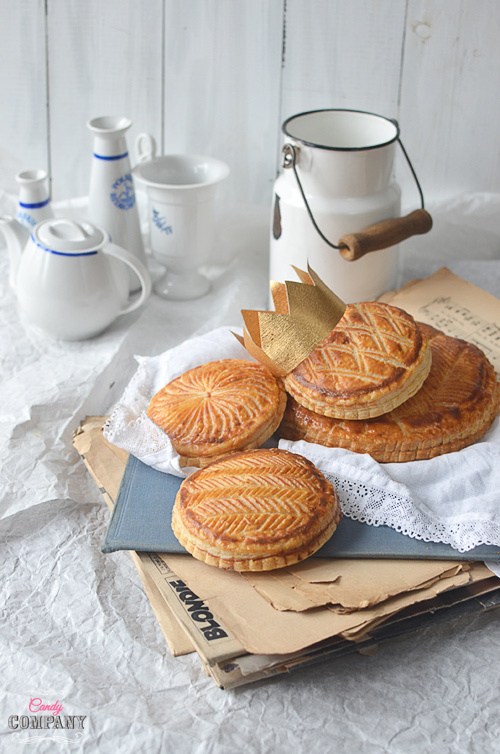 Make a small incision in the middle of the galette, brush the tart with egg wash and cut a design on top of the cake. Cool in the fridge for 1 hour. In the meantime preaheat the oven to 400 F.
Before baking the galette brush it again with egg wash. Bake for about 35 minutes until golden brown. Mix butter and flour and salt and rub it between your fingers until butter is covered in flour and looks like bog crumbs. Add water in 2-3 additions, mixing after each addition. Knead the dough until it comes together, but it’s not smooth, you should still see chunks of butter! Roll the dough into rectangle shape and fold (watch the movie to see how), repeat and after second turn leave the dough to rest in the fridge for 30 minutes. After cooling repeat rolling and folding the dough,after another two turns dough is ready to use. Prepare the filling at least 1 hour before use. Using the whisk or spatula mix the butter and sugar together until well combined (it’s best to mix the filling by hand, you don’t want to introduce to much air inside). Add the rest of ingredients and mix until smooth. Cool the filling for at least one hour. Almond filling tends to be a bit runny and will set up in the fridge. such a pretty cake! and beautiful photography! You won’t regret it 🙂 Thanks Noel! 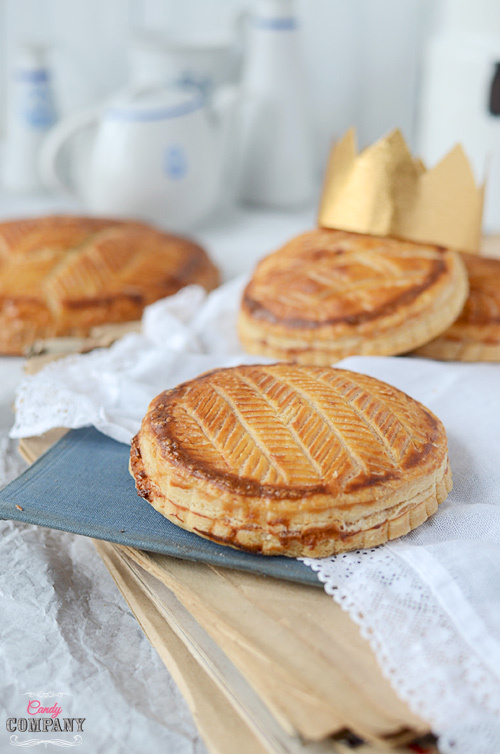 Your galette looks simply perfect, the pastry looks amazing. I would love to try making this one day. This galette looks great! In fact, I would like to try it. Yum! I’ve never actually had the pleasure of eating a King cake but I can say that the ones you cooked up are visually stunning which makes me think I either need to scour my local bakeries for one. . .or bite the bullet and whip one up myself (most likely the later).